Scroll Products of Laurencekirk offers a range of high quality hand crafted decorative wrought ironwork. 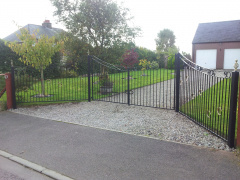 Traditional metalwork skills combined with modern processes in production, finishing and installation. 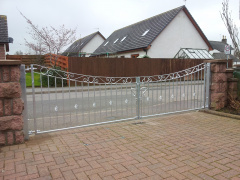 Scroll Products offers a bespoke service, interpreting and developing customers ideas to provide handcrafted ornamental metalwork such as gates, house and farm signs, handrails, arches, weather vanes in Aberdeenshire and much more. Contact us here for a quote.